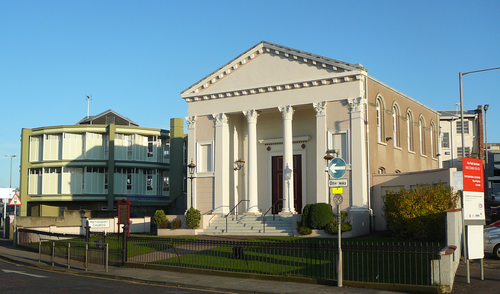 A Brief History of Coleraine Methodist Church. It was in 1774, a quarter of a century after John Wesley's first visit to Ireland, that Methodism first found a footing in the town of Coleraine. In 1777 , an old disused military barrack, situated between Bridge Street and the present Church, was converted into a preaching place, with sleeping accommodation for visiting preachers. In 1778 John Wesley himself came to Coleraine and preached to large congregations in the Barrack Square. He returned in 1785, when he considered Coleraine to be "A clean town, free from noise, and the people very intelligent". In the same year, 1785, an influential merchant named John Gait founded the Sunday School, claimed now to be the oldest continuing Sunday School in Ireland. In 1801 John Gait provided the site for a Church building and Teacher's residence in Queen Street, then known as Preaching House Street. The buildings cost £500 and were in continuous use until the present Wesley Hall suite of premises was built in 1961, at a cost of £24,000. In 1850 it was decided that the work of Methodism in the town warranted better premises and the present site at the rear of the old premises was secured. The Architect was Mr Isaac Farrell of DubIin, who was also responsible for a number of other Irish Methodist Churches and for the original buildings of Coleraine Academical Institution. 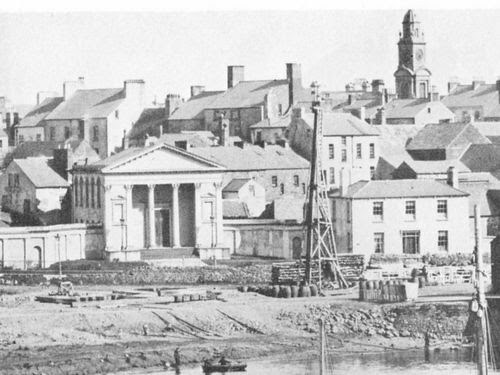 The Coleraine Chronicle of 16th September, 1854, (8 days after the new Church was opened) records that the premises were a great improvement to that part of the town and the Church was an ornamental addition to the public buildings of Coleraine. There followed a detailed description of the Church, which is in the Corinthian Order Of Architecture. Special mention is made of the fine ceiling covered with groined arches and beautifully ornamented. The pulpit of mahogany was stated to be one of the most beautiful to be found in any church in the country. The ground landlords were the Hon. the Irish Society and the Trustees of the Montgomery Estate. The total outlay, including the cost of the Manse beside the Church (on what is now a car park) amounted to £2,540. The Chapel Fund gave a grant of £200, Mr .and Mrs. Archibald McElwaine gave £1,000, £300 came from the Ron. the Irish Society and £50 from the Worshipful Companyof Clothworkers. On-going repairs and improvements over the years include the installation of electric light at a cost of £300 in 1938; a new roof in 1952 at £1,000; and three stain-glass windows behind the pulpit and complete redecoration in 1960. 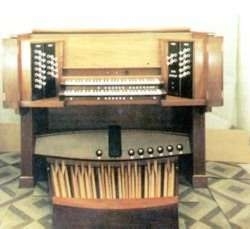 The fine Copeman Hart digital electronic organ was installed in 1988 at a cost of £12,000. A detailed inspection made in 1988 revealed a large number of serious defects in the structure oftbe Church, due to extensive woodworm in the roof and ceiling timbers, dry rot, cracked and broken plasterwork, and an antiquated heating system. A Restoration Fund Appeal was launched in May, 1989, and in January 1992 work started on the complete restoration or replacement of roof, ceiling, floor, plaster inside and out, doors windows and downstair pews. Because the Church is a listed building of historic interest, Category B+ , all the main features, including the moulded ceiling, the exterior facade, the doors and the windows, have all been replaced to look exactly as they were in the original; but in many ways it has been possible to introduce improvements both in materials and details. The total cost of all this work, including carpet, pews, redecoration, and new electrical lighting and heating, was of the order of £200,000. The Rank Trust gave a most generous grant of £30,000; Coleraine Borough Council gave £500; and the Department of the Environment (Historic Buildings Branch) gave £27,690 .The congregation subscribed sacrificially by direct giving and wholeheartedly supported all sorts of fund-raising efforts. The work was completed in April, 1993, and the Church was re-opened and re-dedicated on the 1st of May, 1993, by Rev. Charles Eyre, a former member of the congregation and an ex-President of the Methodist Church in Ireland. (See the full Service Booklet attached below).